Our out-going chairman, Bob Jones, gave his talk on urban archaeology, because this is the subject that sparked his interest when he first became an archaeologist. He was to follow this discipline throughout his working career. The first site was a burgh, founded on the Roman Londinium in the City of London. St. Paul’s was also an interest, which was founded in 606AD and survived to the end of the Roman period. Many burghs grew into successful towns, but not all, for example, Rockly, Lower Weare on the River Axe. He emphasised that Martin Biddle’s list of what constitutes a town still applies and includes some of the following categories: walls, a Mint, central place, large population, diverse economic base, burgage plots, social differentiation, religious organisations and a judicial centre. 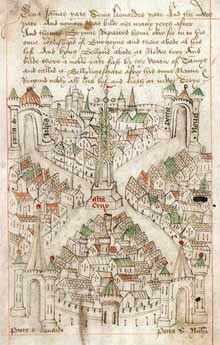 The earliest map of Bristol is Rickart’s Kalendar dated 1479 (see below). 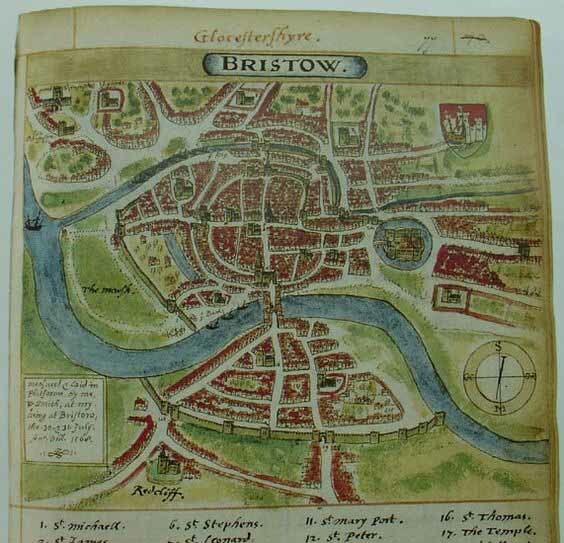 At a later date in 1568 William Smith drew a grid of streets in Bristol (see below). City walls often have a symbolic status; they would have originally been for defence. Outer walls are much more for display. The port was open for shipping and merchants had to pay to go through the city gate. The 13th Century Portwall has been excavated near Temple Meads. The 13th Century Tower Harratz was excavated in 1994 and the Temple Gate and the Marsh wall has also been excavated. Both are 13th Century. By the 12th Century there were abundant churches and London had one hundred of them; Bristol had nineteen; Norwich and Winchester had fifty seven. These churches were a distinguishing feature in the Medieval period. St. Paul in the Bail, Lincoln, has a Roman forum and courtyard dated to the 4th Century AD; it has gone by 600AD. Excavations took place in Bristol in 1962-3 at St. Mary le Port where a late Saxon church was revealed with a Saxon street and Saxon pottery was found nearby. St. Augustine the Less was excavated in 1983 where Late Saxon burials were found, together with Post Medieval vaults. Other religious houses includes Grey Friars, St. James’ Priory, the Carmelites and St. Mark’s Hospital. St. James’ Priory was excavated in 1995, where 200 burials were discovered with evidence of both disease and good living. Some of the burials were of the head-niche type and later in the 13th Century coffins were used. The nails survived at St. James’ Priory indicating the use of coffins. Cabot Circus was excavated where the monastic sites at Baker’s Hall, Cutler’s Hall were revealed. This was a huge monastic complex. Roger Leech’s work has revealed urban lifestyles. He has researched the High Street Vaults, the 15th Century Canynge’s Chapel and the Angel Inn. 12th Century wine casks excavated on the Courage’s Brewery site showed water-logged deposits at Dundas Wharf. These samples were wet-sieved and produced seeds, bones, pottery, sloe stones and diatoms, which can give us vital information about what people were eating in this period. There was also evidence of the dye-ing industry, as quantities of dumped madder were found. There was also a pit that contained a stone-lined cistern, with decayed madder root. An 18th Century glass house at the Portwall was excavated in the 2005/6. 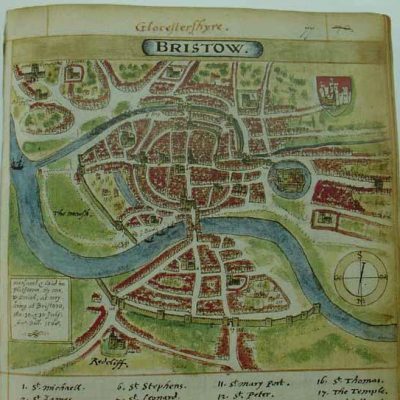 In the 18th Century Bristol was a leading centre for glass production. In the 1960s archaeology was at the hands of the developer as this was the period before PPG16, so there was no control by planning departments. A huge thank you to Bob for not only this fascinating lecture, but on his retiring as BAAS chairman. His contribution and professional knowledge has been invaluable to the BAAS committee.